When a prestigious business district in the making invites artists and ‘creative industries’ to add to its profile and even influence its public space, what politics are at stake? It is an opportunity for the ambitions of the individual artists involved, but to what effect? Can they, in effect, disagree with it? And what does it tell us about the reality of culture in present day up-market city quarters? Logo Parc proposes a strategy that claims the model as a site for disagreement about Amsterdam-Zuidas. The project Logo Parc might seem a work of science fiction, but it is a work of ‘science passion’; the illusory aspect, the fiction, has been replaced by the life force of ‘passion’. The topic is that of the Zuidas, the international business district of Amsterdam. The Zuidas is a public-private development that forms the Netherlands’ highest bid in the international office space market. As will be apparent from other articles in this book, art and design play an important role in its development. The question at stake, however, is what role? I don’t believe it will be possible to conceive of something like a definitive, conclusive essay on the Zuidas. The Zuidas, to a certain extent, is to today’s Amsterdam what the Bijlmermeer was in the nineteen-seventies, except its politics and economics are different. The Bijlmermeer, as most of us know, is considered a ‘failed’ experiment in large-scale housing that came about through the direct implementation and application of utopian ideas about society and human behaviour, eternalized in reinforced concrete. The Zuidas, on the other hand, bears some hallmarks of an opposite, but equally vulnerable utopia. One that centres on not the social and behavioural aspects of urban space but on its economical and aesthetical factors. Its matching material, here, would not have to be concrete, but glass. The commissioned pieces and projects of art and design which accompany large developments like the Bijlmermeer and the Zuidas thus, I would imagine, kind of automatically align themselves with the politics and economics which called them into action. They cannot do anything else than that. By means of analogy: Flies and mosquitos are circulating around the head of a walking elephant like tiny helicopters. They are annoying the elephant, but they are dependent on it as much as on its general direction of movement. Where the elephant is ultimately going, to what goal it is proceeding, is not determined by insects and is literally none of their business – they will simply have to go there too if they want to remain in its ecosystem. Artists and designers, to some extent, are like those flies and mosquitos, with the exception that they can reflect on their own role and position. They can, so to speak, worry about what they cannot change. Let us pause once and wonder where the elephant that is the Zuidas is going if not in any direction we’ve given it. The direction that the Zuidas is going is determined by its value. Not the amount of Euros that its material reality of glass and marble and plastics and carpet and security cameras and boardrooms and cables and antennas and car parks would be worth were it to be disassembled and sold off. Rather, this is about the area’s value as the return on investment once the material, social and financial the Zuidas is fully operational. The principal utopian element in the Zuidas is not to be found in its ‘realistic’ public-private schemes and aesthetical-economic paradigms of ‘wine-and-dine urbanism’. The utopian element is to be found in the assumptions which are made, and the methods which are applied, as to how to establish, sustain and increase such value in the (temporary) absence of return on investment. In these methods, the Zuidas, like the Bijlmermeer, relies on some kind of imagined social contract. In the Bijlmermeer of the nineteen-seventies it was the belief that people would lead happy and orderly lives in their gargantuan hexagonal living quarters amidst seas of green, faraway from the noise of the city and even the whole idea of automotive vehicles (in reality the elevated motorways and parking garages became a principal source of Bijlmermeer terror). In the first decade of the twenty-first century the belief is that the same people – but tanned, better dressed, and more trained in the art of fusion cuisine and sushi – will lead happy and orderly lives amidst the international head offices of multiple multinational financial corporations. This brings a question to the fore that is equally urgent for citizens as well as for artists and designers who engage with the Zuidas or are commissioned to do so. That question is to what extent they politically comply with the regime of the Zuidas. The regime of the Zuidas has it that the potential dissent that may result from the uneven division of power, income and labour conditions is reshaped into a fashionably dressed consent demonstrated by the contributions which artists and designers make to the area. To be sure, such a potential antagonism and conflict is there because the Zuidas, from its makeshift and improvised master plan to its execution amidst the grey slabs of Buitenveldert, presents a radical break with the surrounding urban conditions. Although the Zuidas is not ‘gated’, its radically public and sudden transition from polyvalent urban wastelands and residential areas on both sides of the A10 motorway into a heterotopia for global business and finance does constitute a kind of virtual wall – perhaps we could imagine it as one made of marble. As a corporate resort, the Zuidas concentrates economic power so that it perfectly articulates that those who can afford to work or live there are the ones who ‘have’. This entails the potential conflict with those who ‘have not’ – those involved in cleaning the offices, those who cannot find a place to live in Amsterdam’s overpriced and perverted housing market while the Zuidas boasts soccer fields worth of vacant office space, those who are underprivileged or simply those who no longer wish to passively watch the increasingly abstract and de-socialized theatre of corporate capital, hedge funds and mergers and acquisitions setting its own course. This last group may even involve workers at the Zuidas. Recently, ABN-Amro bank’s employees even organized a rarely seen public manifestation against the acquisition and break-up of their company by Fortis, Royal Bank of Scotland and Banco Santander. Artists and designers are, thus, potentially in the position to say ‘no’ to the Zuidas. But they don’t do that. On the contrary, the aesthetic lure they add to it transforms it into a ‘maybe’ and then into a ‘yes’. Are artists and designers then, perhaps, lured to ‘cash in’ on a Zuidas assignment? Absolutely not. Their contribution has very little to do with ‘corporate art’ (as in corporate sculptures by celebrated artists like Alexander Calder and Montserrat Soto), primarily because their pay check is not raised by the presence of the corporate. They are not part of the cycle of return on investment but are brought in, so it seems, to soften, socialize or aestheticize the potential conflict between those who have and those who have not. In short, artists and designers cannot propose or realize ‘another world’ here. They can funkify the edges of heterotopia and that’s about it, really. But there is one image, more than ever, that both dictates and symbolizes the proposed route to go for the Zuidas. (Metaphorically, the route that the elephant will take.) That image is immaterial. That image is the computer-generated, 3-dimensional mirror of the Zuidas as used by developers to sell the area as a non-material image of future value. That image constitutes the aesthetics of an ‘opening bid’ in the cycle of return on investment. Unrecognized as a piece of art, the future model is where speculative value is visualized. Using computer-generated images, a world is designed that is ‘almost there’. 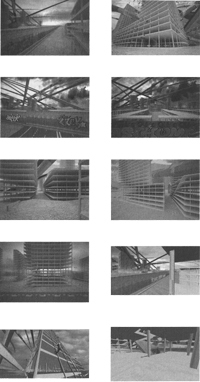 It leads one to think that the task formerly assigned to social utopias and hyper-impossible city models – the proposition of alternatives by constituting ‘not-yet’ future spaces, and note that the Bijlmermeer was the rare materialization of such a space – has fundamentally shifted to that of promoting real estate value. A large part of that utopian image of real estate is only a façade. Behind the façade, structurally, the inside consists of repetitious, identical open plan floors of reinforced concrete. In principle, the worth of this ‘bare space’ is not higher than that of any other space constructed in a similar way. It is its speculative value that counts. The tenants’ and developers’ return on investment on the basis of belief in, and so-called ‘willingness to pay’ for, a fictional entity called the Zuidas. In the slipstream of the development of this structural plan of identical insides and varying fronts, artists and designers are commissioned to ‘add flavour’. The way these interventions are supposed to function is exactly the opposite of that of the real estate developer’s computer-generated future dream. While the latter is supposed to deliver a valuable promise, thus constituting an imaginary bridge between present and future, a public art or design piece at the Zuidas cannot propose such a future. It must create a ‘now’. This is the position that artists and designers working with and inside real estate developments have forced themselves into. But can the added value of these art and design practices – called upon long after principal decisions have been made – be applied to act politically at the Zuidas, which means realizing dissent with it? I do not see political action itself as diplomacy or negotiation, but as the formation of an identity based on the choice for something, therefore disapproving of something else. This may have many effects in practice, including negotiation, but it is eventually about sustaining an irresolvable disagreement. This position is impossible at the Zuidas if artists and designers see the admittedly complex reality of development as a kind of natural state of affairs. In fact, even if art and design are allowed and stimulated to insert ‘smart’ friction and tensions into the already finished programme – of which the core values cannot be contested – they may have to first and foremost attempt to ask public questions about their cause and effect in a system that rests on the (silent) consensus around the values created and sustained by development. Tackling this therefore demands a Houdini act that takes the designer back to where dreams and nightmares were first designed: the virtual 3D model of urban space at the beginning of the cycle for return on investment. The Zuidas 3-D model ‘Discursive Surface’ is situated at the crossroads of analysis and nightmare. In part it consists of stripping down the Zuidas; ridding its architecture of surface, exposing the skeletons. This gesture suggests that the speculative capital of real estate is in fact literally a speculation; a veil that hides the vast empty – structurally identical – areas of concrete, open plan space inside. The Zuidas is now surrounded by a marble wall (a prison of class), on which graffiti tags are placed that form the names of people – thinkers, politicians, architects – who are relevant by making the topic of public space into a discursive surface proper. The octopus inside the Zuidas is globalization; its tentacles, marked with the fading colours of nation states, are conceived as concrete pipes that lead to Singapore, Dubai, London, Hong Kong and New York. Inside these concrete pipes there is only darkness. At the Zuidas the hegemony of class elite is sustained by the massive presence of banks and law firms. We are not talking about a ‘nobility’, but about a class that was largely ‘created’ (we would be tempted to say ‘designed’) by neoliberalism. We can describe this class as the generation that got the first benefits from capital accumulation, in effect the advent of the yuppie as commemorated by Robert Longo in his 1981 work Men in the Cities. The web site ‘Art of the Eighties’ states: ‘The figure in this work seems to be falling, or even dancing, but also may be helplessly contorted by forces beyond his control.’ Longo’s piece was incorporated in the 3D model. The glass façades of buildings are token down, so that not their outside image but their inner structure remains. Please note that the sa-called palaces of business and finance, and the living quarters of the poor – the social housing estates that will eventually be demolished to make room for mare Zuidas – are thus shown to be, as structures, identical. Therefore it becomes possible to ‘see through’ the Zuidas, not only through its rhetoric, but also through its ‘fictitious wealth’, as David Harvey calls it. Advertising architecture, the privately owned ‘street furniture’, has been emptied out. They, too, have become hollow frameworks. The frameworks are rendered red and placed in the same point grid as the follies, pavilions of Parc de la Villette in Paris, by architect Bernard Tschumi. That is to say, the highly rhetorical pavilions of this park, that were called in the French media by their double meaning ‘Ies folies de Mitterrand’, bring us to make the subconscious suggestion that after years of learning from La Villette, literally all we got were these lousy billboards. If we want to examine the possibility of art in public space, capable to unlock the political, we may have to consider how public art practices came into being. They did not start from good intentions. The commemorative statue is much more like how it began. A heroic knight on horseback, commemorating a so-called ‘good cause’ in direct service of the ruling elite: that long forgotten, but basic typology for public art, the statue, is a direct representation of power. As the state lost interest in a direct representation of its rulers (if only because every so many years they were elected anew), and art lost interest in depiction, consequently embracing abstraction, the visual languages of power and art began to diverge. The ‘public art’ that became an obligatory companion of building projects (in the Netherlands) had little or nothing to do with expressing interests of power, but was not contesting them either. Think of enormous industrial or architectural shapes on wind-infested piazzas. Abstraction had been embraced not as an exclusive vanguard but as an everyday language for art. ‘Hello’ became a stainless steel angular object near a newly built school; ‘Goodbye’ became an armed concrete geometrical intervention in the central hall of a residency for the demented elderly, and so on. This was simply the proper language used by artists to express themselves in public. The ‘liberation’ – or political moment – lay in the past. That was when art liberated itself from figuration and hence from making portraits of power. Again, it is important to distinguish this development from forms of ‘corporate art’, which has artists create landmark works mostly for banks and trade centres – an exceptionally well-paid form of commissioned practice that seems more related to logo design, and positions corporations rather as art collectors. When state and market began to converge in the nineteen-eighties, conditions became increasingly hard for abstract art in public space and its regime of absolute political neutrality. There is, of course, no final proof for this, but we could imagine these colossal abstract structures with their good intentions as visual metaphors – symbols that is – for the supposed bureaucracy and inefficiency of the nation state and its practices. In fact, the Bijlmermeer contained a few such sculptures and what is more, the project as a whole may qualify architecturally as a social sculpture which failed as a utopia. In response (not so much to the Bijlmermeer as to the general condition of European political economy in the second half of the twentieth century), the suggestion was that the welfare state was an inert giant predestined to erect irrelevant and ineffective social policies. This suggestion – quasi-legitimized by grotesque examples from former Eastern European attempts at total planning – propelled the neoliberal project as it was carried out by Ronald Reagan and Margaret Thatcher, in the Netherlands under the leadership of Ruud Lubbers and Wim Kok. Neoliberalization governed privatizing state enterprises and liberalizing state regulations; partially to lighten tax burdens and stimulate economic growth, to the effect that new inequalities and class differences were created. By positing that various services hitherto maintained for the good of all have to become profitable businesses, neoliberalist thought no doubt deeply affected the level, accessibility and affordability of public sector services. Additionally, by reducing its own autonomy, the state obliged itself to seek continuous agreement and collaboration with market forces, which, as the indispensable source of money, thus gained increasing control over the symbolic dimension of the public-private partnership. The state became ‘state +’, as social geographer Erik Swyngedouw calls it: state and market rather than state or market. We are still addressing public art here, in particular the strange Dutch rule that has it that 1% of the building budget must be spent on it. While the official commissioning agent for public projects remained the state, it was from that moment on presupposed that it acts in collaboration with private interests. The partnership between state bodies and commercial enterprises, between public and private, became a new paradigm in an era of and-and choices and win-win situations. Everyone involved in the public-private development process became each other’s ‘partner’. The reassuring sound of the word partner supposes that there is nothing to disagree about other than household matters, hence disregarding the possibility that behind the scenes, commissioners and artists might actually defend different positions and represent different interests. In reality, artists working in public space, their commissioning bodies and their various partners often do not agree. But they express their doubts and second thoughts about the consensual treadmill of their joint ventures in private, not in public. In the apparent absence of disagreement, much public art becomes disguised boredom. The task of the work of art becomes to distract, which itself may take the shape of pseudo-revolt. As an aside, there exists a powerful current in public art that seeks to attach itself to the notion of ‘sites’; places that have distinct identities and histories, excavating their ‘repressed’ narratives. Those places are not just square meters to project images upon. They might contain hidden antagonisms as their main characteristic. For example, the public projections that artist Krysztof Wodiczko did on buildings in Tijuana (Mexico) and Hiroshima (Japan) tie themselves deeply to hidden and unspoken local problems – often even locked within people – which they bring to the fore. In the case of Tijuana, it is the border crossing between Mexico and the U.S. In the case of Hiroshima, it is the impact that the A-bomb had on the different generations living there, formulated through a series of interviews where also the families of former Korean slave labourers were included. The way Wodiczko chose to remember it has nothing to do with creating a gigantic imposing statue about pain inflicted to one people – it thus refuses to commemorate the disaster in a consensual way. Yet it doesn’t lose track of a more universal and symbolic realm. Due respect to Wodiczko, both Hiroshima and Tijuana are recognized trauma sites. How does the notion of ‘site’ work at Amsterdam’s Zuidas – if anything a place that seems to harbour no traumas at all? The Zuidas came into being (more or less spontaneously, unplanned, at first) in the late nineteen-nineties, and is still in the process of being built. In that process the Zuidas is both ‘present’, ‘actual’ and ‘not-yet’. It is simultaneously a built reality and a project under semieternal construction, a situation smartly used to make up for its current shortcomings and promotion of future virtues. The Zuidas represents Amsterdam’s main hotspot in the global marketplace of business and finance – which is imagined as a borderless space of connectivity. It is not to be held accountable for its actions by democratic politics and, conversely, we as citizens cannot democratically elect the CEOs of the companies that have chosen the Zuidas as their prime Northern European business location. On the other hand, the ‘value’ of the Zuidas directly relies on such (by definition trans-national) decisions. On an earlier occasion we have described to what extent Zuidas is de-localized from its surroundings, for example by its proximity to the motorway, to high speed train transportation and to Schiphol Airport. In the partnership between the Zuidas’s stakeholders, including banks, project developers and the city of Amsterdam, meticulous attention has been given to ‘public space’, yet only in the sense of its material qualities. Dutch author Camiel van Winkel, in the essay ‘Zeitgeist as Lacuna’, refers to the quizzical phrase ‘high-quality design of the open space’ appearing in the Zuidas master plan, where ‘the standard of quality must be extremely high’ and there will be ‘public space of a quality not yet seen in the Netherlands’. He wonders what that word ‘quality’ stands for. The problem is not just that the meaning of ‘quality’ can never be presupposed – as Van Winkel notes in his conclusion – but that ‘quality’ also serves as a tool to suppress disagreement. Objections against ‘quality’ proper were deemed impossible and unreasonable and unimaginable for any opponent to make. The main tenants at the Zuidas are banks and law firms, sectors which have grown tremendously in the past two decades or so and got cramped in their former canal-based palaces of seventeenth century-style prestige getting disconnected from their increasingly globalized playing fields because of the sheer time it takes to travel from Keizersgracht to the United Arab Emirates via Schiphol Airport. The Zuidas presents itself as the solution to those old barriers. It is located at the centre of everything, characterized solely by its connections. It offers itself completely to the network and, as such, is really an urban version of web 2.0 (with the exception that the ‘user generated content’ has to be brought in by artists and designers). In effect, as a result there are literally thousands of lawyers and bankers working at the Zuidas who, as the affluent upper echelon, until 5 p.m. represent the utmost of decision making power in the Netherlands, and after 5 p.m. represent the utmost of spending power in the Netherlands. The game is to keep them there after 5 p.m. and have them live their whole lives at the Zuidas, while providing them with direct connections to Dubai, Singapore, Frankfurt, London and New York – a global hub, rather than an Amsterdam suburb. The site of the Zuidas is then defined by the presence of those who travel, but may choose not to because they can find competitive alternatives where they live. The parallel desire on the part of the local authority and its ‘partners’, to create both a ‘perpetuum mobile’ of real estate value centred around increasingly trans-national decision making processes, and a vibrant new city quarter with a true social value in the form of its ‘excellent’ public space, brings about the Zuidas as the hallmark of a new, entirely systemic and planned form of neoliberalism that presents facilities solely benefiting the elite as if they belong to the essentials of urban fabric: fitness, wellness, sushi and dry cleaning facilities as proof of a city for all classes. The trauma and tragedy of the Zuidas is that the real potentiality of a radical coexistence of economics and public space is not played out to the extreme, but frozen in a sacred consensus of ‘partners’, where the scary consequences of an urban heterotopia of business and finance are prevented from their full actualization. A similar consensus has, in other contexts, been called ‘post-political’. Artists and designers are the agents of that softening process; they add to the Zuidas the very touch of disorder and friction that makes it acceptable. Trauma is not the same as drama and of course, Zuidas as a built form is merely the messenger of a text that was written elsewhere. To say that under the agreement at the Zuidas public art becomes consensual does not mean that this art is ‘bad’, while it should be ‘good’; not at all (that would be as meaningless a category as ‘quality’ – see Van Winkel). But it does mean that public art practice at the Zuidas, the post-planning ‘cherry on the cake’, needs to show a blind eye to the political context of the place (therefore reading it intentionally uncritically, not recognizing the trauma) for the sole purpose of its own realization. In other words, public art paradoxically is now again the statue of the ruler – by seeming to be the opposite of that statue, by seeming ‘free’. We claim that at the Zuidas, no public work of art that is truly critical of the Zuidas can or may be realized. But it may be unrealized. It may be a model. With Logo Parc, we’ve made the computer-generated 3-D model a site for such a discourse. ‘Quality’: Zuidas rightly asserts that we have become too polite to object to it. Hence the visual practices and creative forces of art and design, called in to render the notion of ‘quality’ tangible, are also extremely polite forces. Ultimately the utopia of the Zuidas is its ‘ambition’ or ‘allure’ – but what else is going to realize such goals than difference-by-façade? Since the development is based on return on investment, it is about ways to imagine certain stacked concrete floors at the Zuidas as more valuable than other such, structurally identical, floors located elsewhere. We can imagine the Zuidas stripped down to a bare essence of naked concrete structure, where there is no longer a value difference between the financial and legal high-rise and the post-war social housing estates in its immediate surroundings. This vision is expressed in the Logo Parc model. What we had asked ourselves in the beginning is whether dissent with the Zuidas can be translated into a public work of art or a piece of design to be realized there. This can be called a political act. The answer is that such a piece can probably not be realized on commission, but that it can be unrealized, i.e. proposed as a model and have its non-actualization stand in the same space between present and future as the 3D model used by developers to secure future value. Here we can go one step further and say that although public art – within the limitations of previously discussed parameters and ‘Dutch circumstances’ – seems to be liberated from the obligation to create imposing statues that service the ruling elite, it is in fact often still doing that. Only the way in which has changed. Its paradigm is now reversed: every public piece of art that is not openly contesting the post-political condition under which it is commissioned, is supporting that condition. It is advancing the supposed agreement and consensus to the point where there will be no longer be any peaceful ways to articulate the difference. Logo Parc was created by Daniel van der Velden, Gon Zifroni, Matthiis van Leeuwen, Katia Gretzinger and Matteo Poli, as a research proiect at the Jan van Eyck Academie in Maastricht commissioned by the Research Group Art and Public Space, Gerrit Rietveld Academie/ Universiteit van Amsterdam, and Premsela: Platform for Dutch Design. It started in the beginning of 2006 and was definitely unfinished in 2007. Daniel van der Velden is a graphic designer based in Amsterdam. He is a partner in the design research think tank Metahaven, based in Amsterdam and Brussels, that focuses on the role of the political in visual identity. His work deals with research informing design practice, especially when creating logos, icons, symbols and maps. Daniel van der velden is currently an advising researcher at the Jan van Eyck Academie in Maastricht, where he headed the Logo Parc research project. He is also a tutor at the Sandberg Institute in Amsterdam and a critic in graphic design at Yale University, New Haven. Katja Gretzinger is a graphic designer, based in Zurich and Berlin. Matthijs van Leeuwen is a graphic designer based in Arnhem. Matteo Poli is an architect in Milan. Gon Zifroni is a spatial designer, based in Brussels.